Chavano ‘Buddy’ Hield was bombarded by scores of excited visitors and Bahamians at the Lynden Pindling International Airport (LPIA). Hield, a rising Bahamian basketball star who was drafted sixth by the New Orleans Pelicans at the National Basketball Association (NBA) draft, was met with a Junkanoo rush out at the airport. Visitors and locals rushed to greet him and take selfies with the Grand Bahama native. Hield graciously and meticulously shook every hand and posed for every selfie. LPIA baggage handlers, taxi drivers, guests, locals and the media alike ran towards Hield as he walked towards his car. It was pure pandemonium. Dozens watched as his entourage, escorted by police outriders, drove away from the airport. Many were giddy and filled with laughter. “I can’t believe I got a selfie,” one tourist said. Unbeknownst to them, Hield was off for food he said he can only find in The Bahamas: Bamboo Shack. Hield will take part in a litany of activities during his visit to The Bahamas. Hield, along with over 30 Bahamian sports legends, will be honored by The Bahamas Ministry of Tourism at the Thomas A. Robinson Stadium in Nassau. Hield said his focus will be to reach young Bahamian children, especially boys. “A lot of kids in Nassau need somebody like me to inspire them, especially the young boys,” said the Grand Bahama native. “I’m really looking forward to the invitational. “I’m excited to be here. I’m glad to be back home. The weather is so different and I’ve been in America so much so I need the food. That’s what I’m missing. Minister of Youth, Sports and Culture Dr. Danny Johnson said Hield has proven to be not just a gifted athlete, but a man of character. “Not since Mychal “Sweet Bells” Thompson have we seen the likes of this individual sitting on my right,” he said. Director General in the Bahamas Ministry of Tourism Joy Jibrilu said The Bahamas has become overtaken by “Buddy-mania”. “You have represented The Bahamas so well and you have made every single one of us so proud,” she said. “More importantly, we are a small nation and in every generation you may be blessed to find among us a special citizen or maybe two who rises to international fame. 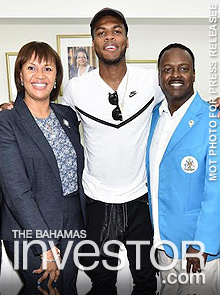 US basketball star and native Bahamian Buddy Hield was honouree at the Ceremonies to Honour Sports Legends at the Thomas A Robinson National Stadium in Nassau last week. See photos of the event here.